You’re a fake! You can’t learn Martial Arts off the net! You have no credentials! Yeah, people actually ask ‘questions’ like this. I’ve been doing Martial Arts since 1967. I wrote articles for the mags, including Inside Karate, Black Belt, Inside Kung Fu, and all the rest. I had my own column in Inside Karate. Aside from popular acclaim, I also have a couple of things you might look at at the bottom of this page. Awaken the inner Soul with Martial Arts Courses! Don’t I have to work with a partner, or something? Yep. You don’t want to be a ‘paper tiger,’ so practice your Martial Arts with a few friends. The best thing is that if you order a course, it’s paid for, so they get to study for free. Or, grin, you could make them pay for half of your Martial Arts course. One dollar. Oh, you mean person, charging so much for karate lessons! What’s the extra fee for the Black Belt Test? I thought it was free? It’s a course I developed to make sure that you are absolutely perfect in your moves, and so that you can make ANY Martial Arts technique work. It costs $25, and you will find out more about it once you sign up. That’s a requisite for the test, but the test itself is free. You’re charging too little. What can I expect for that? You’re just a cheap crook. Another one of those ‘questions’ I occasionally get. All I can say is…read the testimonials. I’ve been delivering mail order martial arts courses since the 80s, and Online Martial Arts courses since 2002. What about a money back guarantee? Got a question? You can use the comments at the bottom of any page. If your question is, uh, embarrassing, you can email me at aganzul@gmail.com. 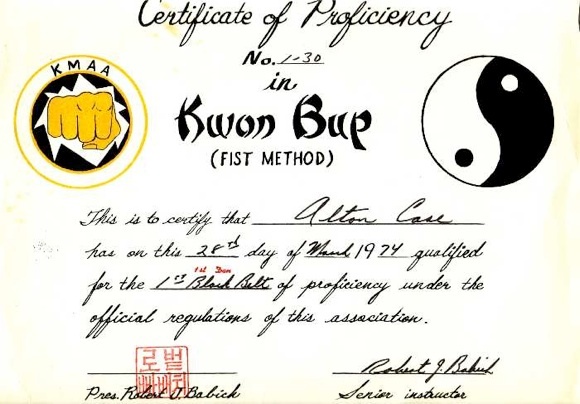 It says Kwon Bup instead of Kang Duk Won because there was a dispute with the Korean Martial Arts Association at the time. Taekwondo was trying to take over, offering free belt ranks to anybody who joined their organization and taught the new curriculum. Bob decided to stay with what he was teaching, and simply renamed his art. There are a few people who would love to have a certificate signed by him. Okay, Al, you’ve convinced me…take me to The Sign up Page!